That's according to a new study that shows increases, on average, have gone up for three straight years, putting a bigger dent in consumers' finances. For the third year in a row, insuranceQuotes and Quadrant Information Services examined the average economic impact of filing various claims on an auto insurance policy. The study also looked at the impact of the claim's dollar amount ($2,000 or more) and compared the average premium increases for all 50 states and Washington, D.C.
"What's most interesting is the trend data showing that it's getting more and more expensive to file a claim," says former Texas Insurance Commissioner J. Robert Hunter, now director of insurance at the Consumer Federation of America, a consumer advocacy group. "There are many reasons for this, like more drivers on the road and the number of accidents on the rise." Drivers who make a single auto insurance claim of $2,000 or more will see their premiums increase, on average, by 44 percent, the study found. That represents a jump of nearly 3 percent from last year's findings. Filing a second claim in one year is even more costly, with an average annual premium increase of 98 percent. According to latest data from the National Association of Insurance Commissioners (NAIC), the average cost of an auto insurance premium in the U.S. is $841, which means an increase of 44 percent would result in about a $370 spike. However, these increases vary by the claim type and typically only kick in for accidents where you are at fault. 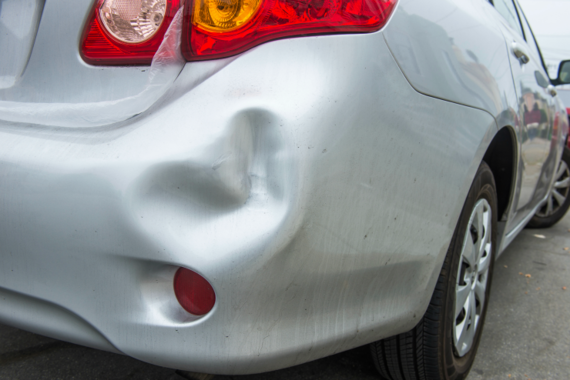 If someone hits you, that driver's insurance will cover the claim and typically your rates won't be affected. For instance, a single bodily injury claim -- which is filed when you cause injuries to individuals as the result of an accident -- will result in an average premium increase of 48 percent. Meanwhile, a single comprehensive claim -- which pays for damage that results from something other than a collision, such as fire or theft -- triggers an average premium increase of less than 2 percent. Mike Barry, spokesman for the nonprofit Insurance Information Institute, says insurers know that if you file a claim after an accident for which you were at fault, you are statistically more likely to file another claim in the future. "Increased premiums aren't a penalty, but a shift in your risk moving forward," Barry says. "Experience tells insurers that a driver who erred once is considerably more likely to do it again. This means you are now riskier to insure, and that risk is reflected in a new rate." 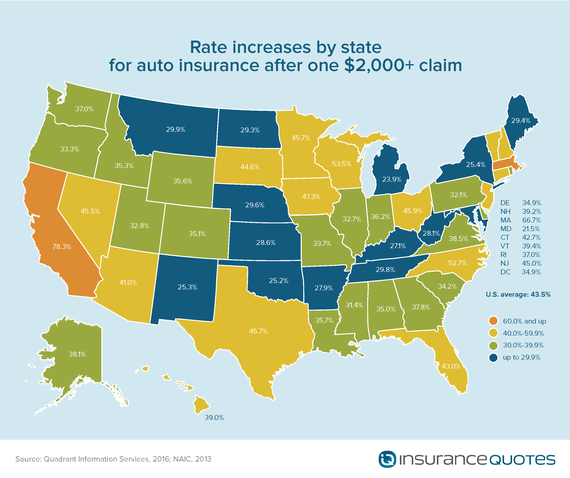 Premium increases vary widely by state, according to the insuranceQuotes study. Meanwhile, other states were far below the national average. For instance, Maryland drivers who file a single auto claim of $2,000 or more will see only a 21 percent spike in annual premiums. According to NAIC figures, that's an annual increase of about $210. According to Hunter, the primary reason certain states show greater premium increases than others is because of different insurance regulations in different states. For instance, California voters passed Proposition 103 in 1988, which limited the factors insurance companies could use when determining auto rates, including a ban on using credit scores. Therefore, California insurance companies must base insurance premiums on three primary factors: driving safety record, average miles driven per year and years of driving experience. Likewise, Massachusetts' auto insurers are prohibited from using non-driving-related factors such as gender, marital status, age, occupation, income or education in setting annual premiums. 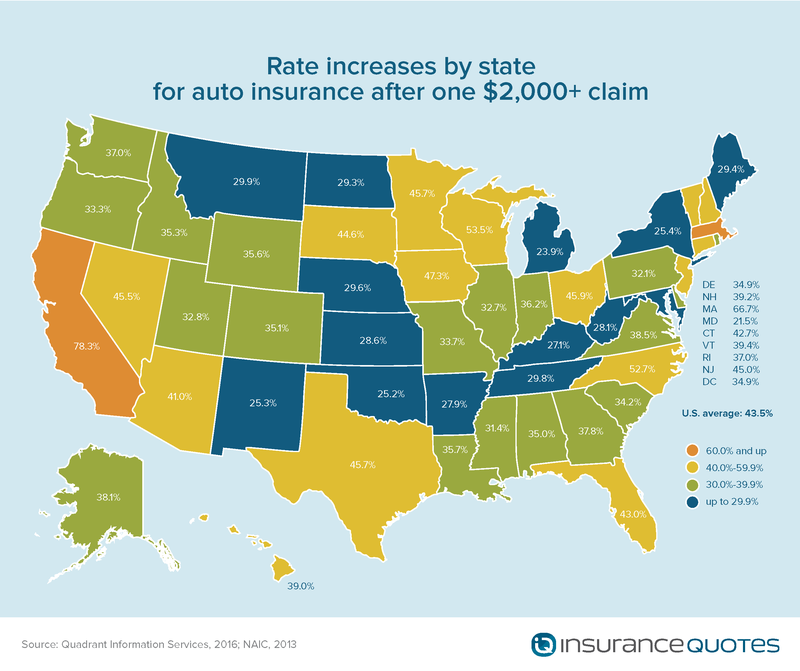 According to Hunter, that's why Massachusetts shows the second most significant premium increase -- 67 percent for filing a single auto claim of $2,000 or more. "In most states, a driver's credit score is going to gobble up most other rating factors, but in states that don't allow it you see a much greater emphasis on someone's driving record," Hunter says. Meanwhile, states like Maryland can use a host of nondriving-related factors when setting premiums, including gender, age, marital status, occupation and a driver's credit score. And while it might seem like bad news for California and Massachusetts drivers who file an insurance claim, Hunter says this benefits the larger population of drivers who have never filed a single claim -- because it encourages safer driving. "Things like credit-based insurance scores are not fair to consumers, but there's nothing wrong with insurance premiums based on your driving record," says Hunter, a critic of credit-based insurance scoring. "About 80 percent of the public thinks your driving record should be the most important pricing factor." According to the insuranceQuotes study, not every type of claim will impact your premium the same way, and bodily injury liability claims are by far the most expensive. 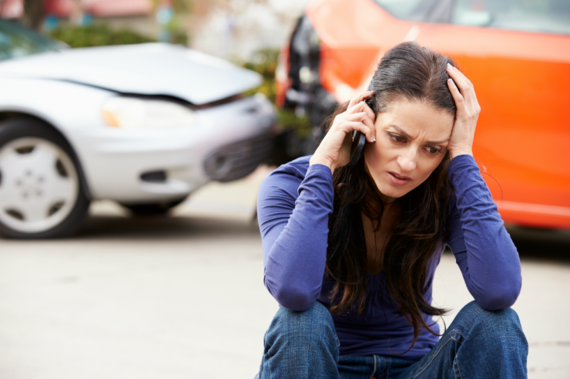 Bodily injury claims are filed whenever a driver causes injuries to individuals as the result of an accident. Washington, D.C., and every state except New Hampshire require drivers to obtain a minimum amount of coverage for these circumstances because they are costly. According to the NAIC, the average bodily injury claim cost $16,640 in 2014 while the average property damage claim was just $3,290. The higher costs of bodily injury claims are because, typically, doctors and hospitals generate larger bills than auto body repair shops, Barry says. 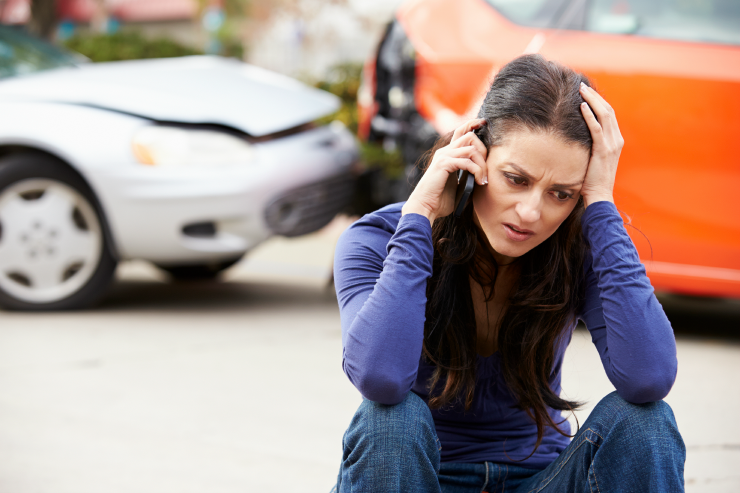 According to the insuranceQuotes study, filing one bodily injury claim of $2,000 or more will result in a national average premium increase of 48 percent (or about $404) per year. Several states buck the national average. 1. California -- 89 percent. 2. Massachusetts -- 73 percent. 3. North Carolina -- 59 percent. 4. Wisconsin -- 58 percent. 5. Iowa -- 51 percent. 1. Maryland -- 21 percent. 2. Michigan -- 26 percent. 3. Oklahoma -- 27 percent. 4. New Mexico -- 27 percent. 5. New York -- 28 percent. "When you've got a bodily injury, it's going to require medical costs and maybe even litigation, both of which are expensive," says Barry. "At the end of the day, it's generally more expensive to fix a person than it is to fix a car." Of the three different claims featured in the insuranceQuotes study, comprehensive claims resulted in the least significant premium increases. 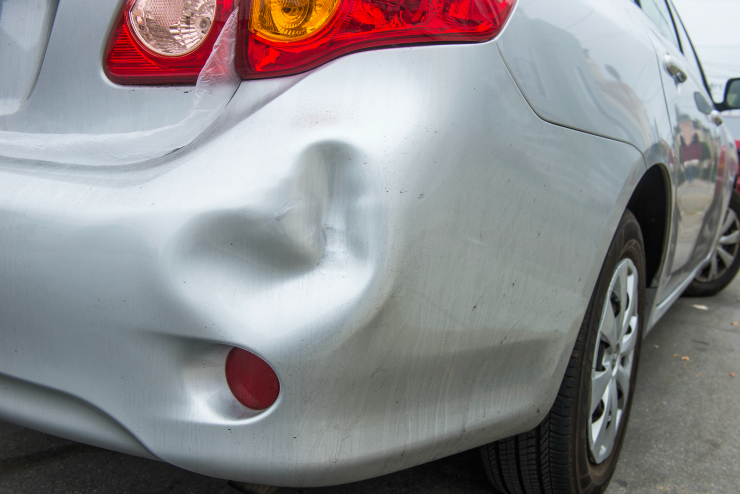 A comprehensive claim pays for damage that results from something other than a collision, such as fire or theft. According to the NAIC, the average cost of a comprehensive claim in 2014 was $1,567 -- but the smaller cost of paying for a comprehensive claim isn't the main reason why it barely affects premiums. "A comprehensive claim really shouldn't impact your premium at all because it's the result of something beyond your control," says Hunter. "If a deer runs out in front of you or a truck kicks up stones that crack your windshield, you shouldn't be charged (more) for that." The numbers support this, to a point. According to the insuranceQuotes study, the national average premium increase after filing one comprehensive claim of $2,000 or more is about 2 percent (or about $17). However, a few states did come in above average. 1. South Dakota -- 14 percent. 2. Nebraska -- 9 percent. 3. Louisiana -- 8 percent. 4. Wisconsin -- 6 percent. 5. Ohio -- 6 percent. "Any increase over 5 percent for a comprehensive claim should be looked at by the state insurance commissioner," says Hunter, "because that raises some serious questions about how insurance companies are using these claims to price policies." Meanwhile, 26 states showed a premium increase of less than 2 percent, and nine of those showed no increase at all. How long do increases stay on your premium after an auto insurance claim? The upside: Premium increases don't last forever. Drivers can expect rates to remain high for between three and five years, depending on the severity of the claim, Hunter says. In the years following your claim you can expect the premium to gradually lower closer and closer to preclaim levels (provided you don't file another claim during that time). Laura Adams is a personal finance expert, award-winning author, host of the top-rated Money Girl Podcast, and insuranceQuotes' senior analyst. For more on auto, home, health, life, and business insurance, click here.